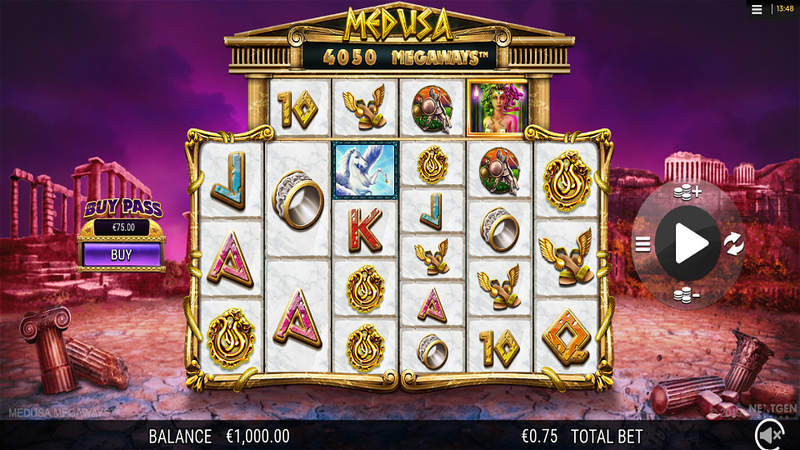 Medusa Megaways is an Ancient Greek mythology-themed slot machine produced by NextGen Gaming enriched with highly-rewarding Megaways feature. Reviving the legend about a powerful and alluring snake-haired girl that turns everyone into stone, the game comes with the unique Snake Strike Feature, Wilds, Scatters, and Free Spins. At the moment, we know a few basic facts about this interesting and potentially rewarding slot game. First of all, the gameplay should be quite familiar to players of all experience levels, meaning you have to line up 3 or more symbols of the same kind on adjacent reels in order to get paid. For this purpose, prospective winners can use Wilds as icons that may replace all paying items. Naturally, they have nothing to do with Scatters, which will be used to activate the Medusa Megaways Free Spins game. Moreover, this title will feature 5 unique in-game bonus features including the Medusa’s Gaze that adds a random number of Wilds to the reels. Throughout the Medusa Megaways Bonus game, the above-mentioned Snake Strike Feature delivers extra Wilds and Scatters, which suggests that you will enjoy additional rounds at the casino’s expense. The official launch date is somewhere in the last week of April. Until the moment comes and we publish the Medusa Megaways slot review packed with the RTP info and sites where you can play online, you can check out the collection of other games produced by NextGen Gaming. Want to see how Medusa Megaways works? Select a recommended casino site from the list below and start playing for free or real – our screenshots will give you a sneak peek!